I think it's a bit of a 'calm before the storm' deal with the releases this week, although there's a bunch of really good ones here. Leading up to Halloween is always busy, so we can expect a ton of releases to come out over the next few weeks. Having said that, there's a lot to look at this week. Click on the titles to buy them off Amazon and, as usual, you can go to our Youtube page and check out all the trailers. 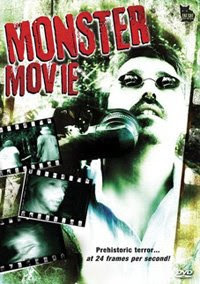 "Monster Movie " comes from Mark and John Polonia. Now, you'll need a bit of back story on these guys, as Mark and John are twins and were always working on horror features until John's untimely death at the age of 39 in February of 2008. So, this may be the last film that they collaborated on, I'm not sure. The two of them have been making films since they were teenagers and actually gained a bit of notoriety in the 90's. Looking through the 20 or so films that they made, you may remember "Splatter Farm", "Hellspawn", "Night Crawlers" or even "Gorilla Warfare: Battle of the Apes"... I don't know. Either way, "Monster Movie" is a Cloverfield-like effort, where 8 rolls of damaged 16mm film reveal one of the most bizarre cover-ups in the annals of true-life events... terrifying menace's in the form of strange reptilian lizards. The DVD offers some bonus features, including: a tribute to co-director, John Polonia. Do yourself a favor and check this out. "The Legend of Bloody Mary " comes from writer/director John Stecenko, who also directed "Marked for Mary: The Game" and "Mr. Id", both of which I'm not familiar with. "The Legend of Bloody Mary" is, in fact, not the ongoing saga of what I consume on most mornings. It's actually based on the legend of the Bloody Mary Witch that comes out of the mirror if you call her name. Stecenko actually comes from a cinematography background, so, if anything, the film's worth checking out simply for the way that it's shot, where he used both 35mm and HD mediums. I can't beleive it, but the Uwe Boll madness continues, although his power does seem to be fading. There's been Boll releases the last two weeks and, although he didn't direct, write or have any creative input on it, he did executive produce "They Wait ". It stars Jaime King, who you probably know more-so because she was one of the world's top fashion models - turned actress. I'm trying to think what film or TV project she'd be best known for, but nothing really stands out. She was in "Sin City", "White Chicks" and "Blow". Either way, "They Wait" is an original film, heavily based on J-horror story lines. A couple returns to North America, having lived in Shanghai, and soon after they arrive, their son see's ghosts and suffers possessions... and it's all tied to the Chinese festival of Ghost Month, when the doors of hell open and angry spirits are given the chance to terrorize the living. Could this really be the second week in a row that we've had a release with Hercules himself, Kevin Sorbo, in it? That can only mean one thing... it's another Sci-Fi original release! "Never Cry Werewolf " also stars Nina Dobrev from "Degrassi: The Next Generation" and it was directed by Brenton Spencer, who's spent a lot of time directing TV shows, such as "Stargate: Atlantis", "Earth: Final Conflict" and "Andromeda". He's also clocked a lot of hours in the cinematography department, having worked as a DP on a ton of projects. It's basically a rip-off of "Fright Night", but is supposedly pretty good. (I haven't seen it) I would like to make a side note here. Is it me, or does it seem like werewolf movies are making a bit of a comeback? I'm seeing more and more of them, although they all seem to be of the low-budget variety. That doesn't mean anything, though... that's usually where it all starts. Is "The Breed " really just coming out now? I saw this forever ago... anyhow, it came out in 2006 and was directed by Nicholoas Mastandrea and stars Michelle Rodriguez. It's Mastandrea's directorial debut and it wasn't too bad, to be honest. It was produced by Wes Craven and it's really about a bunch of rabid dogs on a deserted island. There's not mythical creatures or anything, just an entire island filled with a vicious breed of dogs who like to kill people.